This month’s newsletter contains information on two upcoming events: The 7th International Forum for Sustainable Asia and the Pacific (ISAP2015) and a symposium titled “Regional Applications and Nexus of the Ocean Health Index”, and one past event: an international symposium on biocultural diversity held by UNU-IAS OUIK. We would also like to inform readers of some calls for submissions from the Intergovernmental Platform on Biodiversity and Ecosystem Services (IPBES), and to share a recent case study from the College of Life and Environmental Sciences, Minzu University of China. IPSI members the Institute for Global Environmental Strategies (IGES) and the United Nations University Institute for the Advanced Study of Sustainability (UNU-IAS) will collaborate to hold the 7th International Forum for Sustainable Asia and the Pacific (ISAP2015) on 28 and 29 July 2015 at the Pacifico Yokohama Conference Center in Yokohama, Japan. ISAP is a major event held each year, with speakers on sustainability from around the Asia-Pacific region and the world. The theme of this year’s event will be “Solutions for Change: Forging Multi-stakeholder Partnerships towards 2030”, with a focus on the Sustainable Development Goals (SDGs) and climate change. More information can be found on the IGES webpage here. A symposium will be held on 1 July 2015 in Nakajima Hall at the University of Tokyo in Japan, titled “Regional Applications and Nexus of the Ocean Health Index”, and organized by IPSI partners the Graduate School of Agricultural and Life Sciences of the University of Tokyo and Conservation International, along with Ocean Alliance. Speakers from within and outside the IPSI community will speak on a number of topics related to SEPLS and ecosystem services with the purpose of sharing information about the Ocean Health Index and exploring possibilities for the future. A page (Japanese language only) for the symposium can be found on the Conservation International website here. The online registration form (English and Japanese) can be found here. 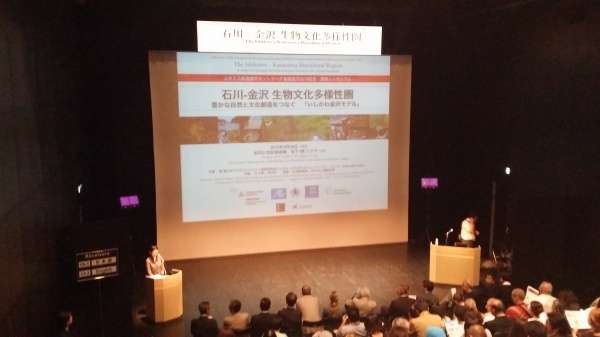 The United Nations University Institute for the Advanced Study of Sustainability Operating Unit Ishikawa-Kanazawa (UNU-IAS OUIK) recently held an International Symposium titled “The Ishikawa – Kanazawa Biocultural Region: A model for linkages between biological diversity and cultural prosperity” on 28 May 2015 in Kanazawa City, Ishikawa Prefecture, Japan. The event was held to mark the UNESCO Creative Cities Network Meeting in Kanazawa, held from 25 to 27 May, and served as a first step in establishing the Ishikawa – Kanazawa area as a model for biocultural diversity. All three of the keynote speakers at the symposium were from IPSI members. Mr. John Scott from the Secretariat of the Convention on Biological Diversity (SCBD) and Dr. Ana Persic from UNESCO both spoke from the perspective of the UNESCO-SCBD Joint Programme on the Links Between Biological and Cultural Diversity, and Dr. Mauro Agnoletti from the University of Florence, Italy spoke about the creation of the Florence Declaration on Biocultural Diversity. Other speakers also were from IPSI partners and friends including the United Nations University, Kanazawa University, Ishikawa Prefectural Government, and others. 1: Thematic assessment of pollinators, pollination and food production (Deliverable 3a) and report on policy support tools and methodologies for scenario analysis and modelling of biodiversity and ecosystem services (Deliverable 3c). More information is available on the IPBES website hereand here. 2: Indigenous and local knowledge for regional assessments of biodiversity and ecosystem services. More information is available on the UNESCO website here. IPSI members and friends who have any contributions to make to these assessments are encouraged to consider making submissions. The IPSI Secretariat recently received a case study report from partner organization the College of Life and Environmental Sciences, Minzu University of China, produced in collaboration with the Nanjing Institute of Environmental Science, Ministry of Environmental Protection of China. Congjiang County is located in the Dong Autonomous Prefecture of Guizhou Province, China. The Dong people have created the “Rice – Fish – Duck Symbiotic System” over thousands of years in this county. In the system, traditional varieties of glutinous rice seedlings saved by the Dong people are used and fish are bred in the terrace fields. When the fish grow to ten centimeters long, ducklings are put into the terrace fields. The rice provides shade and organic food for the fish, ducks and other aquatic animals. The fish and ducks play an important role in weeding, cultivation, fertilization, oxygen supply, eating pests etc. This ecological cycle has achieved good economic, ecological, social and cultural benefits. The full case study can be found on the IPSI website here.